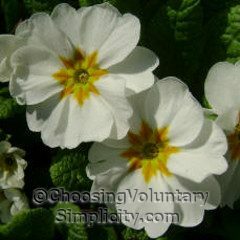 Common primroses (Primula vulgaris)… also called English primroses… are very easy to grow. They like partial shade and moist, fertile soil with lots of organic material mixed in. They must be planted where there is good drainage, because if the soil stays too moist during the winter, the plant will almost certainly die from crown or root rot. Over the last few years I have also added other different color variations by sowing my own collected seeds. Sometimes I open the dried seed pods and scatter seeds on top of the soil around my existing primrose plants, but primroses will also seed themselves. The seeds need light to germinate, so I don’t cover them with soil. I have found that the best results come from seeds that are sown as soon as the seed pods have ripened. If the seeds are stored, the germination rate will go way down. 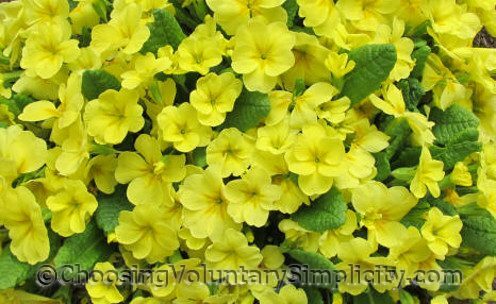 If growing conditions are favorable, primroses will quickly spread to become huge mounds of foliage that are absolutely covered with blooms. 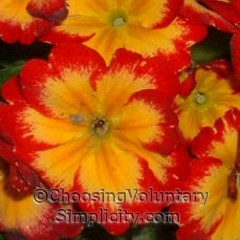 Primroses like cooler temperatures and will not do well in direct summer sun. They flower here in early spring and again in mid to late fall. My primroses are growing under the outside edges of several snowball bushes, and they are flourishing in these somewhat sheltered locations. 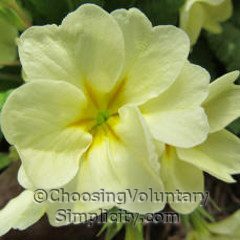 I have found yellow primroses to be the easiest to grow, but some primroses are not winter hardy here, and the more vivid colors can be a bit temperamental in our zone 4 growing conditions. 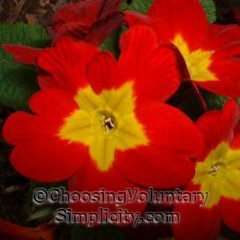 I have had very good results starting primroses from seed… and most of my different primrose color combinations originally began with one small packet of ten purchased “mixed” seeds. I love my primroses! They’re still producing flowers at the time of the first snow… and the flowers are still there (albeit a little winter weary) when the snow melts again in the spring. This happens every year, and I’m always amazed that these tough little plants can continue to show blooms all winter… even under snow and in below zero temperatures. 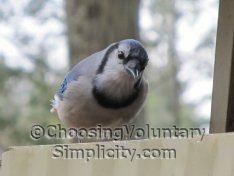 Are these photos from your own garden? They are all so pretty. 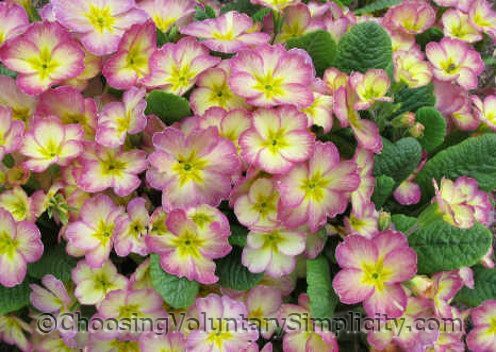 I was looking at some empty spots in my garden early in the spring and thinking that primrose would be the perfect thing to fill those spots (I don’t currently have any.) Thank you for information! Thanks for the compliment! Yes, all of the photos are of my plants and flowers from my own garden. 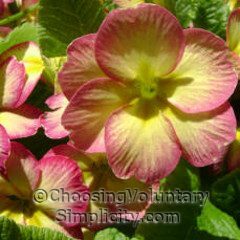 I think you would love having primroses… they are so showy and require almost no care. Do you plant them in the spring when they are for sale as potted plants everywhere? I especially love the yellow! I have set out purchased plants in the spring and sown purchased seeds in the spring, but I scatter seeds from my own plants as soon as the seed pods ripen in either spring or fall. The yellow primrose is one I started from seed I collected. I have never grown Primrose flowers but got one for Mothers Day. I don’t even know if I have ever seen one growing. Mine is in a ceramic pot so would it grow inside? have a place in the front of the house but it get dry and I’m not the best when it comes to taking care of plants. Try to get care free or almost, but I’m going to see if this will be alright out there. Have to go get some Miracle Grow potting soil for a few other plants so will wait till then and add some to the dirt. Thanks for the pictures.. I have grown primroses in the house for a few months, but they always seem to reach a point where they look like they need to be outside. There is one type of primrose that is grown as a house plant. I think it is a cape primrose. I have my primroses growing under snowball “bushes” that have grown to be more like trees, and the soil there now stays somewhat moist and the primroses do very well. 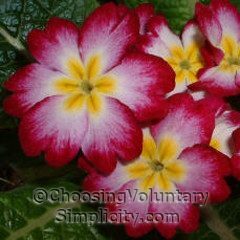 If your soil is extremely dry, your primrose would do better in moister soil, although I think a lot depends on the primrose. I have bought some that have not thrived no matter what I did. Others seem to thrive regardless! I’m sorry I can’t give you a more definitive answer. What a great web site. Your pictures are outstanding. Just started looking so will be enjoying myself as I will be spending some time here. Ah… I love primroses! But like so many English plants, we can’t grow them here in the Philadelphia area (almost Zone 7), probably due to a combination of the heavy soil and our hot, humid summers. If I ever move to New England, these will be high on my list! Gorgeous pictures. I love my primulas too! They grow so easily and bloom when nothing else is in bloom yet! I have found a way to grow primroses in my zone 8 Virginia costal region. I have lots of Hostas in my shade garden areas and I plant a hardy primrose on each side of the hostas. The primroses bloom very early and hostas are later to emerge. The hosta leaves cover the primroses and protect them from some of the heat we endure here.